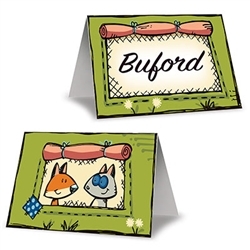 Let your fellow outdoorsy folk know where he/she will be sitting at the party with these Woodland Friends Place Cards! Just write his/her name on the blank section and place it at the seat where they will be sitting. Each place card measures 4.25 inches and has two woodland friends looking at each other on the opposite side of where his/her name will be written. Comes eight Woodland Friends Place Cards per package.